Washington, DC, is a world-class, prospering city. But housing challenges are clouding its future and keeping some citizens from enjoying its new prosperity. The city’s population has grown dramatically over the past 15 years, increasing the demand for housing. To keep up, the city needs to build more housing and preserve existing affordable housing. 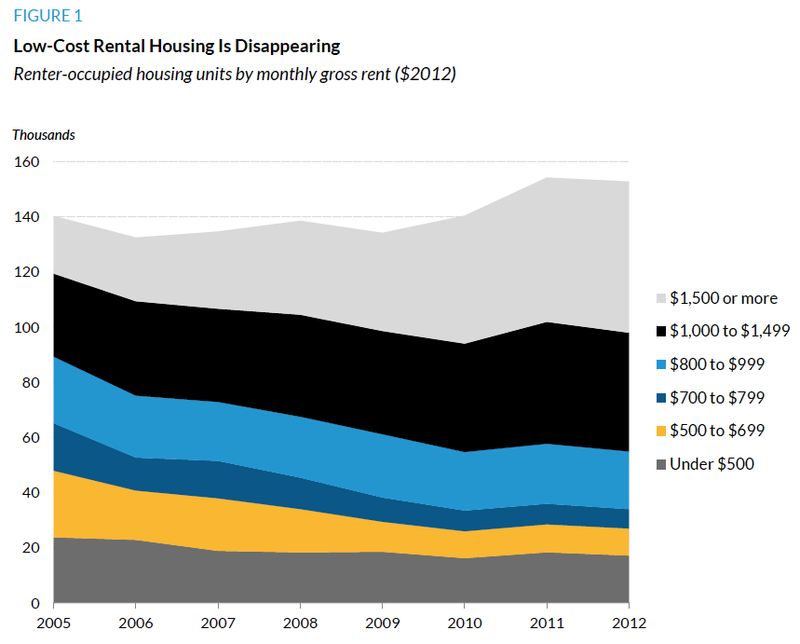 Rising demand has strained the supply of rental housing, with lower-cost units rapidly disappearing (figure 1). Assisted housing, a crucial safety net for low-income renters, is at risk of disappearing as neighborhoods redevelop and property values increase. The need is especially acute for renters with incomes at or below 30 percent of the area median. And much of the rental stock is aging: almost half of apartments are in multifamily buildings 50 years or older. Such old stock often requires reinvestment. High prices have put homeownership out of reach for many first-time homebuyers. For example, a household supported by a full-time food service manager and a part-time office clerk, with an annual income of $75,000, could have afforded only 19 percent of the homes sold in DC in 2011. The same family could have afforded three-quarters of the homes sold in Wards 7 and 8, yet homeownership rates remain low in this part of the city: less than 25 percent of Ward 8 households own their home. enough to cover even today’s affordable housing gaps. More resources may be needed, but is the city making the best use of what it has? In a survey of affordable housing developers in DC, 72 percent said that delays in receiving local funding significantly limited housing production; 60 percent said that difficulty in obtaining permits was an equally serious obstacle. Finally, homelessness is an urgent challenge for the new mayor. 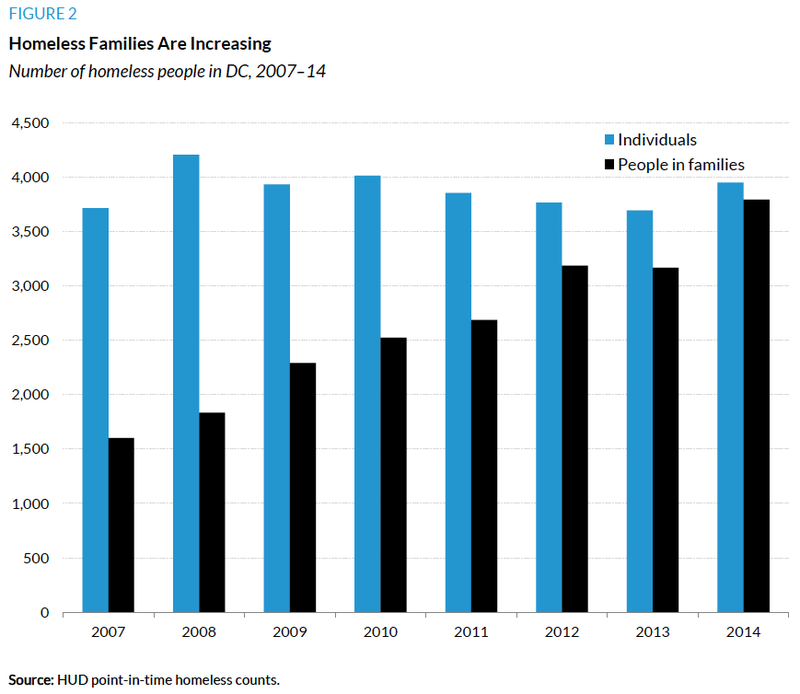 DC’s homeless population is rising, largely from a growth in homeless families (figure 2).1 Lack of affordable housing for the lowest-income renters is a key factor in this increase. In addition, chronically homeless people need housing with supportive services to help them stabilize their situations, and such units are in short supply. The high demand for housing means the city must increase the supply of market-rate and assisted housing by producing more units at different affordability levels and preserving existing affordable housing. The mayor and her administration should expand the resources and tools available to support housing development. IMMEDIATE ACTION: Guarantee a minimum funding level for the Housing Production Trust Fund in the fiscal year 2016 budget. The trust fund, one of the city’s most important tools for creating and preserving affordable housing, has had wildly fluctuating funding because it relies on a share of the deed and recordation tax, which varies according to the housing market. New legislation passed by the DC Council in November 2014 would establish an annual minimum of $100 million. The mayor should continue her support of this legislation and ensure that appropriate funds are allocated. IMMEDIATE ACTION: Implement the District’s Opportunity to Purchase Act (DOPA) guidelines to support affordable housing preservation goals. Passed into law in 2008, DOPA allows the mayor to purchase, on the city’s behalf, residential multifamily properties being offered for sale with more than 25 percent affordable units.2 This potentially powerful tool could be used to preserve affordable housing. The mayor should set forth guidelines and regulations to make this program operational. using historic preservation tax credits to preserve aging affordable housing. Explore new revenue sources for affordable housing. One possibility is a linkage fee that would require commercial developments or businesses to contribute toward affordable housing programs. Such fees have been used successfully in Boston and San Francisco. When the Comprehensive Housing Strategy Task Force (CHSTF) recommended a linkage fee in 2006, the Office of Planning concluded that it would have limited financial benefits. But the city’s development environment has changed over the past several years, so taking a fresh look at a linkage fee would be worthwhile. While DC has limited space for new development, the mayor can support expanding opportunities to create new housing of all types throughout the city. Give wider consideration to nonresidential, city-owned, and publicly owned land for residential development, with clear goals for affordable unit production. Publicly owned land is a key opportunity for new housing development. Although some notable examples are already being pursued (St. Elizabeth’s, McMillan Reservoir), others can be explored. For instance, the city is currently holding in reserve closed school buildings. Properties that are not needed for educational purposes could be made available to affordable housing developers. Priority should also be given to public lands near current or future public transit stops and major transportation corridors. Allow aging commercial properties to be redeveloped into mixed-use properties with residential units. The CHSTF recommended changing zoning to allow more residential development in commercial areas. DC has several commercial properties in need of modernization. Allowing such properties to be redeveloped as mixed use might encourage investors to support their renovation. Revisit lifting height restrictions more strategically (i.e., aligned with affordable housing priorities). A recent attempt to raise height restrictions ran into opposition, but a renewed effort aligned with affordable housing goals—such as increasing height limits in areas near transit or along major roadways—might have more chance of success. While more resources and new tools may be needed to increase residents’ access to affordable housing, the mayor can also improve planning and strategic use of what is currently available to ensure that resources are used effectively and aligned with key goals. IMMEDIATE ACTION: Convene housing agency heads and senior staff to promote better coordination of housing activities and goals and to discuss ways to improve the entire public system of housing assistance and services. Emphasis should be placed on “busting silos” to ensure strong collaboration and an overall commitment to improving the agencies’ performance along citywide housing goals. This convening should include the directors of the DC Housing Authority and the DC Housing Finance Agency, over whom the mayor does not have direct authority but who need to be strong allies given the crucial roles they play in DC’s housing system. Consolidated performance data, which are currently tracked by different agencies, and a discussion of how individual agency efforts are coordinated to align with citywide housing goals. Goals and strategies that recognize different needs and priorities across wards and neighborhoods. For example, the Williams administration coordinated efforts in priority neighborhoods based on current conditions and expected changes. A formal affordable housing preservation strategy that would establish priorities and set parameters for the use of preservation tools and resources. An example is the proposed strategy produced by the DC Preservation Network Strategy Working Group. A strategy to align the work of housing agencies with social service agencies, such as the Department of Employment Services and the Department of Human Services. Measure performance of city agencies and contractors against individual and citywide goals. Agencies and public contractors should have clear performance goals that are aligned with city objectives. The administration should hold them accountable for achieving these goals. The administration may also need to reform and modernize parts of the housing system to improve their effectiveness and efficiency. IMMEDIATE ACTION: Streamline systems that are unnecessarily increasing the costs of housing development. Both the 2002 and the 2012 CHSTF reports recommend improving the efficiency of parts of the housing system. An Urban Institute survey of affordable housing developers has also identified difficulties in dealing with city bureaucracy as an impediment to creating more affordable housing. One possible reform is creating a fast-track permit review process for affordable housing developments. IMMEDIATE ACTION: Increase staffing and resources for the inclusionary zoning (IZ) program to ensure that it can be implemented robustly and can respond effectively to the city’s dynamic housing market. The IZ program, which leverages private investment rather than requiring direct public subsidies, is an important tool for creating affordability in new market-rate developments. The city recently issued new IZ regulations to address some early challenges, but the program must have enough staff and resources to be effective. Modernize housing data systems. The city has invested considerably in creating a cross-agency housing development database. That work should be continued to make the system fully operational. Other recordkeeping systems also need to be modernized, particularly the paper recordkeeping system for the rent stabilization program. Automating this system would be a necessary first step for studying the performance of this program, which may affect as many as 90,000 units, and evaluating possible reforms. Reexamine the performance of key housing regulations, programs, and policies, particularly those that have been in place a long time without being reassessed. In addition to rent stabilization, the Tenant Opportunity to Purchase Act is a key program that should be reviewed to see if it can be made more effective. During her campaign, the mayor committed to ending homelessness in DC by 2025.3 She should take short- and long-term actions to help the homeless this winter and eventually eliminate homelessness. IMMEDIATE ACTION: Begin to fund capital and operating costs needed to end homelessness—such as resources for building new supportive housing and expanding the local rent supplement program—starting with the 2016 budget. IMMEDIATE ACTION: Strengthen rapid rehousing, which provides rental assistance and supportive services. The city has improved this program, but it lacks key protections for families, special assistance for households headed by younger people, and clear performance standards. IMMEDIATE ACTION: Put a new shelter plan in place while working on longer-term reforms. Addressing the needs of the homeless population more permanently will take time, but many individuals and families are already in dire situations. The mayor needs to create and issue an emergency shelter plan as soon as possible to ensure their needs are met. IMMEDIATE ACTION: Provide families year-round access to emergency shelters. Though the need is certainly acute during extremely hot or cold weather, families who become homeless at other times of the year may have no safe place to stay while waiting for services. The mayor should also pursue these longer-term actions to reduce and eventually end homelessness. Provide the ICH director more resources and budget authority. The ICH director is an appointed position to coordinate the activities of the ICH and its members. With no staff or budget authority, however, the ICH director’s effectiveness is limited. The mayor should explore ways to increase the resources and authority associated with this position. Make successful pilot reforms permanent. For example, coordinated entry and emergency rental assistance for singles should be strengthened and made permanent. Create more permanent supportive housing. The city would need to add about 2,715 units of permanent supportive housing to eliminate chronic homelessness by 2017, according to Urban researchers. Plan ahead for large shelters. Several large shelters will need to be replaced or redeveloped in a manner that will meet future needs and avoid interrupting vital services. The inclusive process for redeveloping the Community for Creative Nonviolence shelter could be used as an example for other shelters. Address gaps in the current system. Certain populations, such as unaccompanied youth, minors with children of their own, and minors who are victims of domestic violence, lack adequate help and support. These gaps in service coverage should be filled. Affordable housing has long been a challenge for many DC residents, but the extraordinary growth of the past decade has made it increasingly difficult for low- and even moderate-income households to find a home they can afford. These challenges, years in the making, will not be solved overnight. But the new mayor has a great opportunity to build on past progress and lead DC into the next decade with a renewed commitment to being an inclusive city for all Washingtonians. 1. The homeless numbers do not include homeless youth living by themselves, which is a very difficult population to count. 2. DC Official Code 2001 ed., as amended, §§ 42-3404.31–37, Subchapter IV-A. District's Opportunity to Purchase. 3. “End Homelessness in the District of Columbia by 2025,” position paper issued by Muriel Bowser for Mayor. This memo is presented as part of Challenges and Choices for the New Mayor, an initiative of the Urban Institute as part of Talking Transition DC. The views expressed are those of the author and should not be attributed to Talking Transition DC or to the Urban Institute, its trustees, or its funders. Copyright © December 2014. Urban Institute. Permission is granted for reproduction of this file, with attribution to the Urban Institute.